One of the things we loved to do as children was chase (and capture) fireflies, or lightening bugs as we sometimes called them, in the summer. There was something magical about being out in the quiet evening chasing the blinking lights. We'd put them in jars and poke holes in the lids for air. We'd sometimes put grass in the jars, too, thinking this would be good for them to eat. 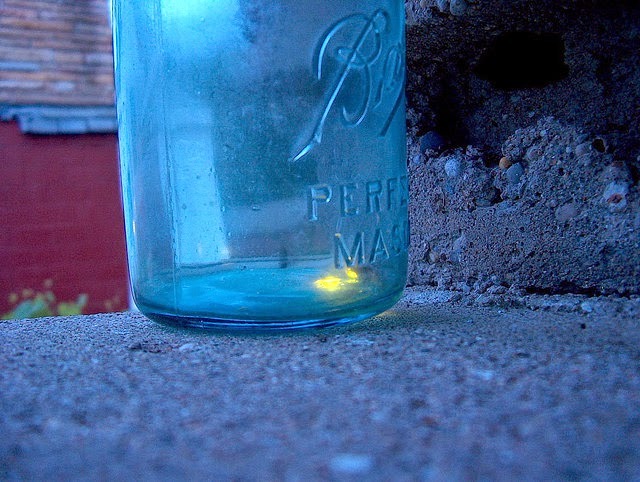 Fireflies in a jar by jamelah e.
I haven't seen fireflies in years, but then, I haven't been looking for them either. The mosquitoes usually drive me back inside in the evening before it gets dark. I wonder if fireflies are still out this time of year in south Georgia.